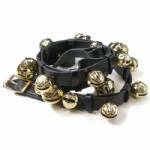 This black body strap with 23 new solid-brass bells was adapted from design #143 sold by Starr Bros. Bell Co. in 1915. There are doubled-up smaller bells at the ends and a series of single larger bells in the middle. The additional smaller and medium sized bells brighten the sound of this bell strap. Small set with #3 (1 1/4") bells at the ends and a #11 (2 3/8") center bell. The bells in this set are numbered #3-3-4-4-5-5-6-7-8-9-10-11-10-9-8-7-6-5-5-4-4-3-3. Medium set with #5 (1 1/2") bells at the ends and a #13 (2 5/8") center bell. The bells in this set are numbered #5-5-6-6-7-7-8-9-10-11-12-13-12-11-10-9-8-7-7-6-6-5-5. Large set with #7 (1 3/4") bells at the ends and a #15 (2 7/8") center bell. The bells are numbered #7-7-8-8-9-9-10-11-12-13-14-15-14-13-12-11-10-9-9-8-8-7-7. The strap is 1 1/2 inches wide and about 84 inches (7 ft) long. It has buckles at both ends. The separate billet included with this strap adds another 8" to 18" to the length. When this billet is used, this strap will make a loop from 92 to 102 inches around. This will fit many full-bodied "light" horses, warmbloods, and moderate-sized drafts. Longer or shorter billets may be ordered separately to fit your horse (or other use). This strap will also fit nicely over the shoulder of the average- to larger-sized Santa and can be used for display and Christmas-time fun in the home. We make each sturdy bell strap from black USA-tanned bridle leather. The strap has a full leather lining, so the backside of this piece is smooth leather to protect your horse and harness (or your wall or door). The lining, buckle, and "keeper loops" are all stitched for durability. We fasten the bells onto their strap with solid-brass bell pins. These pins are large, sturdy, and properly designed to see decades of use on horses.